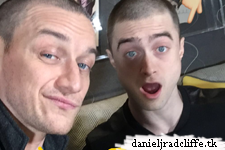 Mashable did already post a tweet last week asking for questions to Daniel Radcliffe and James McAvoy. They took over Mashable's Snapchat account today (here's a behind the scenes photo) promoting Victor Frankenstein. Really funny, I enjoyed it. Update: 26th November 2015. Yesterday they were featured on Snapchat again (two new clips) below is one of them.